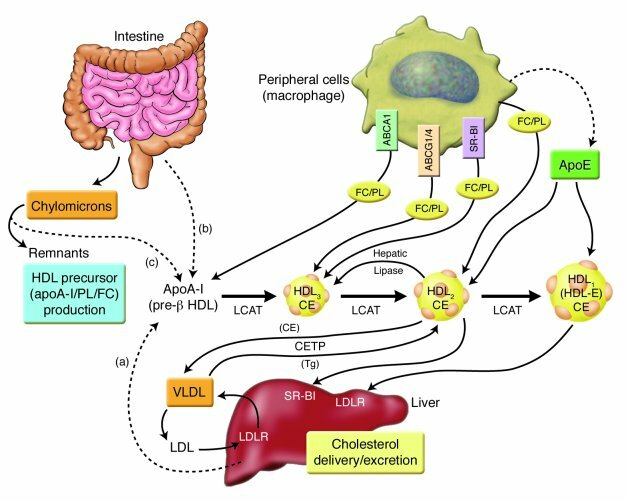 Role of HDL in the redistribution of lipids from cells with excess cholesterol (e.g., macrophages) to cells requiring cholesterol or to the liver for excretion. HDL precursors (pre-β HDL) are produced by the liver and intestine (apoA-I/PL/FC) or derived from surface material from chylomicrons after lipolysis (a, b, c). Pre-β HDL, HDL3, and HDL2 can accept cholesterol for reverse cholesterol transport. ApoE allows HDL2 particles to expand by enrichment with CE of the core after LCAT converts free cholesterol to CE. Larger HDL-with apoE (HDL2 or HDL1) can deliver cholesterol to the liver directly via the LDL receptor. FC, free cholesterol; HDL-E, HDL-with apoE; LDLR, LDL receptor; PL, phospholipid; SR-BI, class B, type I scavenger receptor; Tg, triglyceride.